Ready to take your winemaking and cheesemaking to a new level? We can help you at Curds and Wine! We have an Advanced Wine Kit class designed to show you how make your wine kit unique and exceptional, and prepare your homemade wines for the San Diego County Fair Homemade Wine Competition. Attending the Winemaker Magazine Conference in Monterey is another great way to improve and expand your winemaking skills - from kits or fresh grapes! This month Lum Eisenman will give a free seminar about Facilities and Equipment for Home Winemaking. And, it's time to start getting ready for harvest season - sign up for our 3-part seminar series to learn how to make wine from fresh grapes. We also have some Advanced Cheesemaking Classes in collaboration with Venissimo as well as a very special Wine Tasting and Cheese Making Experience at Milagro Farm Vineyards and Winery - see more information below. Just in time to start making your entries for the Homemade Cheese contest at the San Diego County Fair! Join us at the beautiful Milagro Farm Vineyards & Winery barrel cave for a very special cheese making demonstration and wine tasting experience! Winemaker Jim Hart will introduce you to the vineyards and award-winning wines of Milagro Farm. Following a tour of the vineyard, Gisela “G” Claassen of Curds and Wine will demonstrate how to make several cheeses you can make at home, including chevre, ricotta salata, and pressed cheeses. The tour and demonstration will include tastings of several Milagro Farm wines paired with a variety of cheeses in the lovely Barrel Cave at the Vineyard. This will be a very special experience not to be missed! Must be 21 or over to attend. Limit 20 participants. No refunds on tickets. 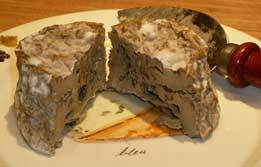 Advanced Cheesemaking Classes by Curds and Wine and Venissimo! Venissimo and Curds and Wine team up to bring you a special set of Advanced Cheesemaking Workshops. In each session you will learn the history, science, and techniques for specific cheese types. Samples of each cheese type will be served while you hear about the origin and background of the cheese, then Gisela “G” Claassen of Curds and Wine will walk you through the science of how the cheeses are made and do a live demonstration of making the cheese. You will also have a special opportunity to see whole wheels of these very special cheeses, as well as homemade examples. You will also receive a 10% discount coupon for Venissimo as well as Curds and Wine! * If you sign up for all 3 classes you only pay $200 total and lunch is included! Discount should automatically be applied at checkout online. These classes will be held at 7188 Clairemont Mesa Blvd, San Diego, CA 92111, in the same building as Curds and Wine. Classes are limited to 14 people per session. Tickets are for sale through Venissimo or online only, not available at Curds and Wine. This class is limited 12 participants; must be 21 or over to participate. Tickets are $45/person, paid participants ONLY admitted to class. Light snacks from Venissimo will be served. No refunds on tickets. Purchase tickets in the shop or online. The amazing seminars are always informative and will expand your horizons as a winemaker. Lunches and dinners are a great time to meet fellow winemakers from around the world, and of course sample some great wines! >Curds and Wine is a sponsor of the 2013 conference, and if you will be attending please let us know, we have a special gift for you! You can register online now. Every conference has sold out so far, so don't miss your opportunity! Limited Edition Wine Kit Releases Available Now! In case you forgot to reserve your 2013 Limited Edition Wine kits, we have a few extra ordered - but only one or two of each are currently available! Contact us to see if we have any in stock - don't miss out on these amazing wines! If you did preorder the upcoming wine kits, we will contact you when they arrive! In association with San Diego Amateur Winemakers' Society, Curds and Wine will be hosting bi-monthly home winemakers' seminars. These seminars are held every even numbered month on the third Saturday at 1 pm. Seminars are given by Lum Eisenman, a winemaking guru that we are lucky to have in the San Diego area. Lum will share his expertise on various winemaking techniques and issues. This month Lum will discuss "Facilities and Equipment for Home Winemaking". $15 per entry, 2 standard (750 mL) bottles of wine per entry; you receive 2 tickets to the Fair AND 4 tickets to the award ceremony, entry by ticket only! More information and entry forms are available online here. $10 per entry, 4 ounces of cheese plated for judging per entry; you receive 2 tickets to the Fair AND 2 tickets to the award ceremony, entry by ticket only! 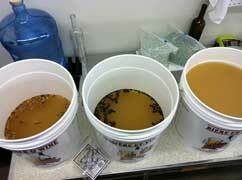 Curds and Wine will be a drop-off point for entries in the Orange County Fair Homemade Wine Competition this year! The Orange County Wine Society, in conjunction with the Orange County Fair, is proud to sponsor the 37th annual Orange County Fair Wine Competition. This will be held on Saturday June 8, 2013 at the Orange County Fairgrounds, Costa Mesa. 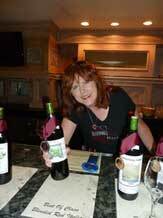 All amateur winemakers in California are invited to submit their wines for judging. Last year there were 829 entries from all parts of California. Wine Entries are to be submitted On-Line. This will allow you to quickly submit your wines, calculate fees, make changes up until the deadline, enter the Wine Label Competition, and minimize errors. There are instructions and a tutorial video that will guide you through the process. We suggest that you take advantage of them before you begin. The link for entering your wines is competition.ocws.org . More information is available at their main site: www.ocws.org. You will need to submit one 750 mL bottle of your wine labelled as directed in the entry information and pay a $10 entry fee per entry; if you plan to have us ship your wine for you a shipping fee will also be automatically added when you register yoru entries online. DEADLINE: Last day to drop off wines to be shipped from Curds and Wine is SUNDAY MAY 12TH. We will not be able to accept any entries for shipping after that date, although you can drive your entries up to Orange County as late as May 18th. Join us at Curds and Wine for a three-part seminar series introducing you to making wine from fresh grapes. In these seminars, we will go through preparation for harvest, steps involved in making wine from fresh grapes, and finishing wine. 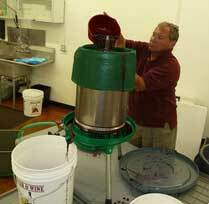 We will also demonstrate how to use equipment needed for winemaking. The series of classes is $100/person for series of 3 classes, no refunds if any classes are missed. This fee includes snacks and refreshments. Maximum 20 participants for these classes, you must be 21 or over to participate. This course is a seminar series with live demonstrations, but we will not be making wine in this class; fresh grapes can be purchased separately and made at home.